Victor found the perfect dessert. 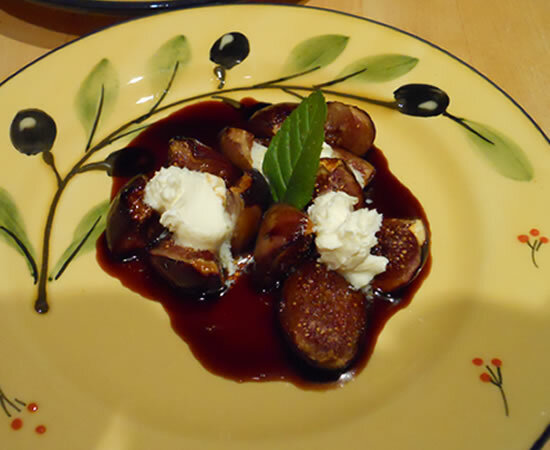 He was watching TV yesterday and somewhere saw figs roasted with balsamic vinegar and topped with a dollop of mascarpone. Wouldn’t you know that we just happened to have all three ingredients in the house tonight?!? Take about 3 figs per person and cut through in quarters about 3/4 through. You want the figs to stay intact. Place them in a small buttered casserole, sprinkle with a teeny bit of sugar and drizzle with good-quality balsamic vinegar. Bake at 350° for about 10 minutes. Place three figs on each plate and drizzle with the accumulated juices. Place a small dollop of mascarpone cheese in the center of each fig, and serve. This was really good. The perfect ending to the perfect day.